The rare 1980s Bartolini tube-it Distortion Overdrive pedal made in Livermore, California, USA. Makes any amp sound like a Marshall. 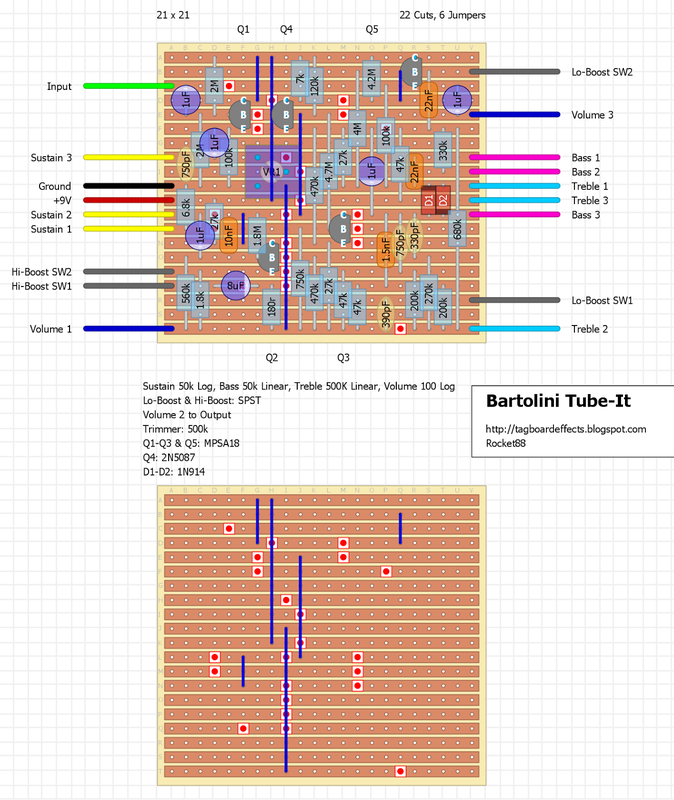 This may be the only pedal Bartolini ever made. Three position switch for more or less overdrive -- plus treble, bass, sustain and output controls. It was designed to emulate the distortion characteristics of an early 80s Marshall JCM-800. Probably made in the mid 80's. 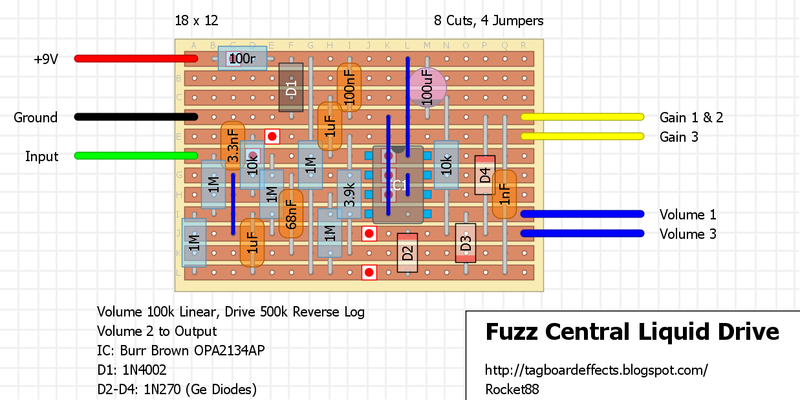 Three way boost switch unloads tons of gain from mild to overkill. 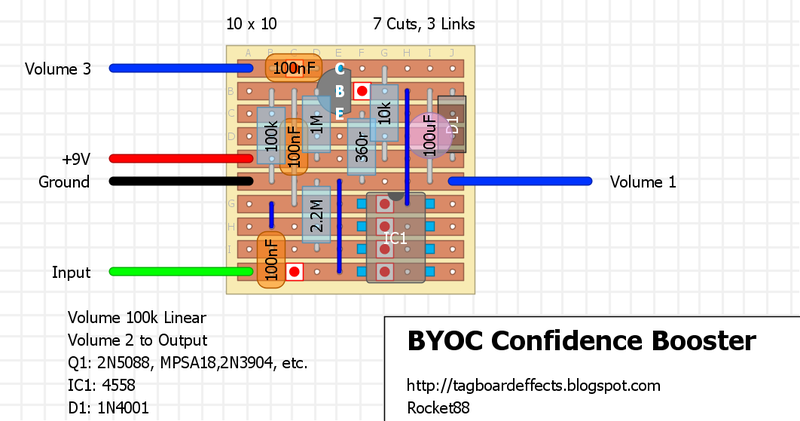 The circuit is set in a giant block of epoxy so there are no clones or schematics available. Does anything from smooth, cleaner OD to straight up blistering, sustaining lead tones. Has the three way boost for different tone styles. Can do TS-9, Marshall, or its own thing all together. Controls include bass, treble, sustain , and output. Whip the bottom off the tube-it and inside there's a little trim pot for adjusting the sound to be bit more, or less present. All models may not have this option. The trim is a small plastic wheel (see photo in the Disqus section) similar to the color to the exterior paint job. 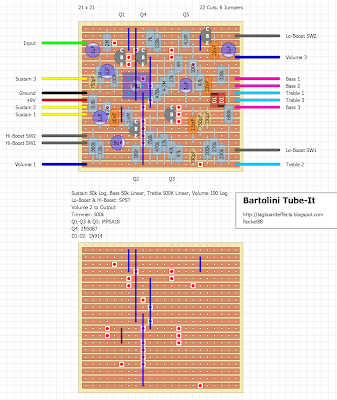 Some of the tube-its were said to be mercilessly treble boosted. The pedal can get a sound like a healthy Tube Screamer in the first position. Now up the boost one notch, to add a little more drive, and fullness. Perfect for lower output pickups. Need some grind? Just flip the boost switch to position three. It's at least double the increase in gain, as between positions one and two. The circuit is now presenting significant drive, and a fuller, slightly distorted tone. Let's not forget the absence of tone suckage when it's not kicked in. A very fine, versatile pedal. 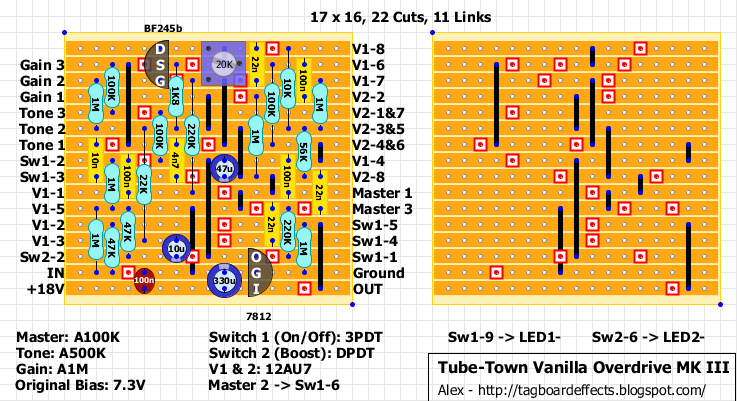 The only thing I changed was make the high low switch 2 different switches so you can control each one independently. 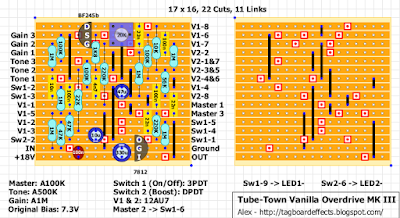 Here is a serie of tube effect pedals by the German Tube-Town which were requested a while back. 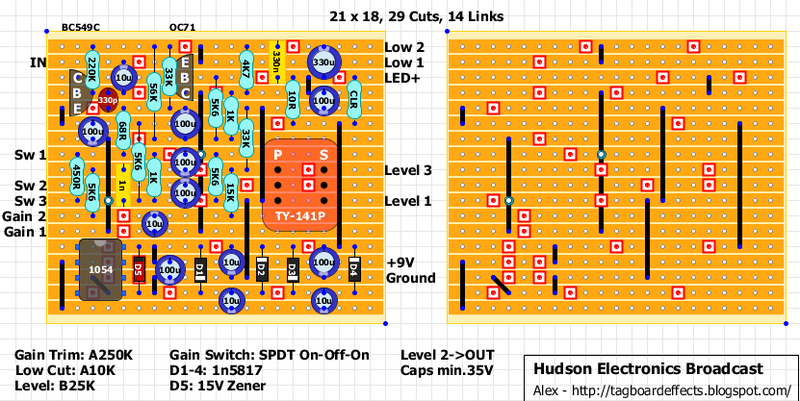 There aren't videos available but you can find all infos, schematics and pcbs on their website here. Came across this the other day and since I'm in the mist of finals I figured it would be a nice way to get my head away from my work and relax. Basically this is just a modified Ross Distortion, but has enough differences that I feel warrant a layout of its own, plus not sure how may people have seen it before. 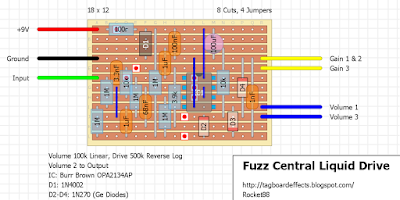 More Treble Response: For more treble response in the circuit, specially tailored for my modified Fender Telecaster and Twin Amp, I changed the 10nF input capacitor to a smaller value, in this case a 3.3nF. 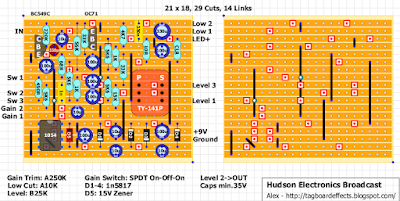 More Low-End Response: To get a little more low-end response out of the circuit, I increased the value of the 47nF capacitor that's attached to pin 2 of the IC to 68nF. Use Non-Polar Film Capacitors Instead of Tantalum: In order to get more clarity from the circuit, I've replaced the two 1uF Tantalum capacitors with 1uF non-polar AVX boxed metal film. They're larger than the tants, but I think their better sound quality is worth making a little more room on the circuit board for them. In the end you can try different diodes and Dual Opamps and see what you like best. I know I'm not the only one that's a big fan of the DOD250/MXR Dist+/Ross Distortion for it's great tone, simplicity, and the ease at which it can be tweak to your liking. 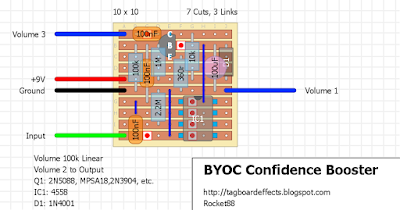 The BYOC Confidence Booster is just a simple linear boost and buffer. The only change i made was moving the trimmer offboard to make a pot. 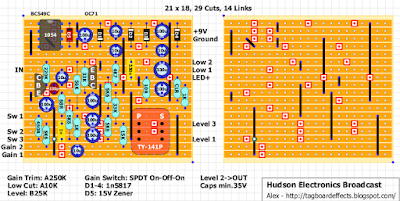 Figured this would be a nice easy project for those that want to get started building pedals. Here is a simple distortion pedal by Carl Martin.